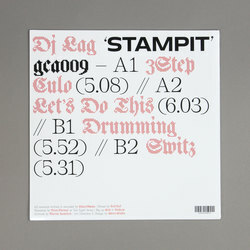 DJ Lag - Stampit EP. Vinyl EP. Bleep. DJ Lag returns to Goon Club Allstars (Rudeboyz, Mssingno) with a new EP. Stampit sees the ‘Gqom King’ turning in another set of vivacious South African club fare. The first two tunes here pick up where DJ Lag’s 2016 EP for GCA left-off. Opener ‘3 Step Culo’, with its infectious flute lick and rolling drum pattern, has been making waves in the clubs for some time now. This is followed by ‘Let’s Do This’ - classic Lag fare, all droning bass and trance-inspired synths. The B-side tracks find him subtly blending his trademark style with new influences. ‘Drumming’ and ‘Switz’ both combine gqom with trap chants and drumline sounds that nod to go-go.